Website Design with SEO Built-In! Your website will only be successful if potential customers can find it! Web Design & SEO are two sides of the same coin; together they are the basis of a profitable online business. Webmedia has been helping local small & medium sized businesses for over 20 years, get a working website that contributes to their online success. Make that first impression count. Responsive web design helps create the best first impression. On desktop, tablet and mobile. Every website needs visitors! Finding & attracting visitors to your website is the lifeblood of your website’s success. More visitors, more customers, more sales! There’s no point just getting them there to let them slip away again. If the do they might never return. Knowing who your visitors are, what they do and what they want when the arrive on your website is crucial. Knowing if they succeed is critical. Not Getting Enough Website Visitors or Sales? Webmedia can help you make the changes to get the results you want! Inbound marketing uses the power and the platforms available on the internet to find, satisfy and convert searchers into your customers. Traditional (outbound) marketing was based on who could shout the loudest and catch the attention of the often uninterested passer-by. Be that by the press, magazine and billboard advertising, direct mail, yellow pages or other forms of interruption marketing. Success was often determined by who simply had the biggest marketing budgets and able to out-buy the competition. Search (seo), social media (twitter, facebook, foursquare, google+ etc), video (youtube), blogs all offer you, the online marketer, large or small, invaluable opportunities to find, communicate and engage with your potential customers. The Internet has changed the marketing landscape. Business and consumer shoppers, have turned marketing up-side-down! They now actively search and seek out who they think can satisfy their needs. The biggest companies, organisations, businesses may still just have an edge with their often staggering marketing spends. But, you can compete with them by being more inventive, more flexible and quicker off-the-mark responding to changing markets and conditions. 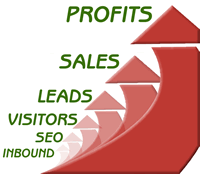 WebMedia SEO Inbound Marketing can help you compete and beat the competition. Just enter your details in the box below to find out how! We have been helping small & medium sized businesses reach the top in Google and other search engines for over 10 years. Will you be next? Webmedia has been helping local businesses do just that for more than 10 years. For a website that works harder to generate more leads and sales? Just complete the simple form.